The Paris-based Eutelsat company says its latest spacecraft has failed less than 24 hours after being launched on an Ariane rocket from French Guiana. The satellite operator said the W3B platform had developed a leak in its propellant system and could not raise itself to its operational orbit. The 5.3-tonne spacecraft was to have been stationed high above the equator at 16 degrees East, to provide TV, radio, internet and other data services to Europe, Africa, the Middle East and Indian Ocean islands. The company already has another satellite in production called W3C, and this will be moved into the 16-East slot when it launches in the second half of 2011. "It's a massive disappointment," said Eutelsat's Vanessa O'Connor, "but our job now as an operator is to continue our services and make sure W3C gets there as soon as possible, and that we expedite the new programme to replace W3B," she told BBC News. W3B's co-passenger on the Ariane flight was BSat-3b, a TV services platform owned by Tokyo's B-Sat Corporation. It has not reported any problems. Both spacecraft were released by the Ariane within minutes of each other. Ordinarily, the spacecraft would have used their own propulsion systems to circularise and refine their orbits at a geostationary altitude of some 36,000km. But engineers in contact with W3B noticed through Thursday night that the satellite was losing propellant. 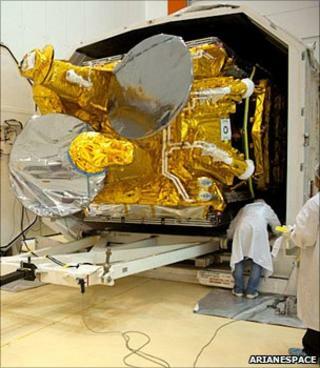 With insufficient means to refine its orbit, Eutelsat had no option but to declare the mission lost. The company is one of the world's four big fixed satellite services (FSS) operators. Its fleet of spacecraft positioned around the globe carry thousands of TV channels. W3B was to have replaced three other spacecraft at 16 degrees East, bringing more capacity and capability. In December, the company will return to the launch pad with Ka-Sat, its first broadband-dedicated spacecraft for Europe. This will be targeted at more than a million subscribers in rural areas who are currently poorly served by terrestrial internet providers.